Max H. Specht was born in Spring Branch, Texas, 21 July 1910. He graduated from New Braunfels High School in 1927, attended Southern Methodist University and graduated from Southwest State Teachers' College in 1939. General Specht's military career began when he joined Service Battery, 133d Field Artillery Regiment on 1 April 1937. He was commissioned a second lieutenant 16 June 1939, and was mobilized with his unit 25 November 1940. He served in the European Theater of Operations in World War II and was released from active duty in May 1946 as a lieutenant colonel. He returned to the Texas National Guard as commander of the 155th Field Artillery Battalion on 10 February 1947 and served in various assignments until he was promoted brigadier general 22 September 1961 as Division Artillery Commander, 36th Infantry Division. 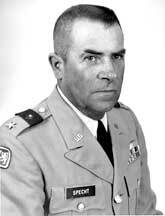 He became Assistant Division Commander on 1 March 1963 and retired from the Army National Guard, 7 October 1965. In recognition of his service to his state and nation, he was brevetted major general on 20 May 1969. Not content with being retired from the military, he accepted the post of Commanding General, Texas State Guard on 1 June 1969. Under his leadership, the Texas State Guard received funding from the Texas State Legislature to conduct paid training exercises and assisted the National Guard and local civilian authorities in numerous natural disasters and local emergencies. He reorganized the State Headquarters from a tactical to a non-tactical directorate-type to better plan and supervise the operations of the State Guard, more in line with their mission. He retired from the State Guard on 31 July 1974, ending a career of military device of over 32 years. General Specht's leadership in his community is evidenced by his service as the Superintendent of Schools for Comal County and his membership in numerous military and civilian service organizations. In recognition of his many accomplishments and dedicated service, General Specht was awarded the Legion of Merit, the Texas Medal of Merit and numerous other state and federal awards. The impact of his dynamic leadership and devotion to duty to the State Military Forces remains today in the present Army National Guard and Texas State Guard.